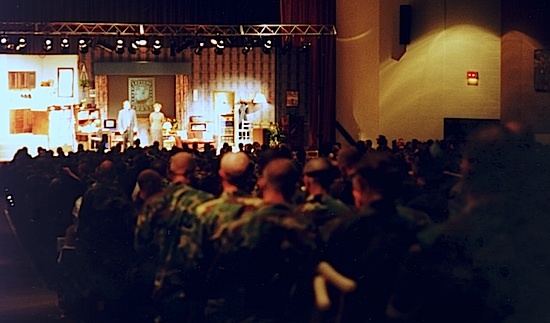 Letters From the Front is a self-contained professional theatrical touring production that has been entertaining and moving military community audiences at installations around the world since 1991. It is a three act play that is often referred to as a ‘dramady’ because of its artful blend of pathos and humor. It is a unique blend of World War II era music, dance, costumes, and images staged on a full Broadway-style set. Total running time from first curtain to curtain call, including intermission, is approximately two hours and twenty minutes. The show comes with a full Broadway-style set and its own light and sound system. According to the Shreveport Times, Letters From the Front is a “tear-jerking, hand-clapping, mind-blowing two hour stroll through history” that weaves actual war letters into the story of a courageous war mom and the exasperatingly lovable man in her life. Letters From the Front is a crowd pleaser with proven appeal to active duty personnel and their families, as well as veterans and civilians. It has consistently demonstrated an ability to entertain audiences of all ages except those too young to understand its war-time themes. It’s April 23, 1945 in New London, CT. In her cozy bungalow, nationally renowned essayist Katharine Hartgrove finds the disciplined and orderly life she normally leads crumbling into chaos. Her son Stuart is fighting with the 5th Army in Northern Italy and the man in her life, Johnny Chastain, has just walked through her front door like a two-legged typhoon with way too many hands. And one of then is carrying a suitcase. When Johnny (Bob Curren) arrives at the home of Katharine (Bobbi Kravis), his intentions are all too clear. Johnny is America’s favorite radio comic who is living the high life in Manhattan, and although he and Katharine have been dating for over a year, this is his first visit to her abode. Katharine invited him up for two reasons. One is personal: she feels it’s time to put their dizzying romance to the test. The other is pragmatic. She’s been commissioned to write a play about the American spirit as revealed through war correspondence dating back as far as the Revolutionary War. Having never written anything to be performed before, she plans to take advantage of Johnny’s considerable showbiz acumen to help her get through the project. This could be her salvation, or the worst mistake she has ever made. 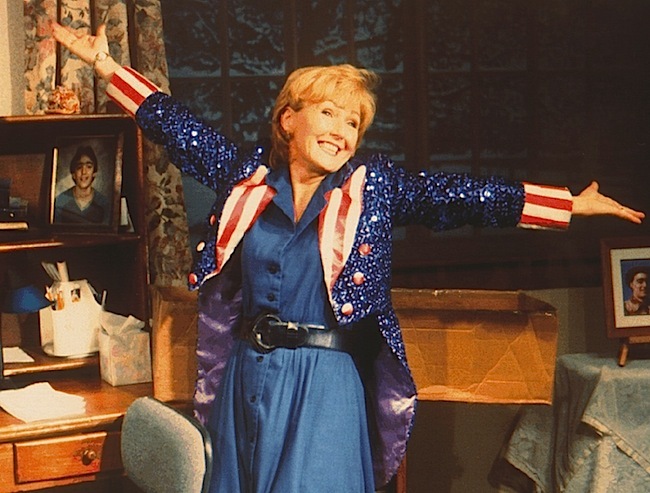 Johnny’s irreverent and often madcap antics make Katharine laugh, not only at him, but at herself, despite her concerns over Stuart and the daunting task of writing the play. Johnny is welcome relief at first, but his tone soon turns cynical, even mocking, leading to a contest of wills and wit. 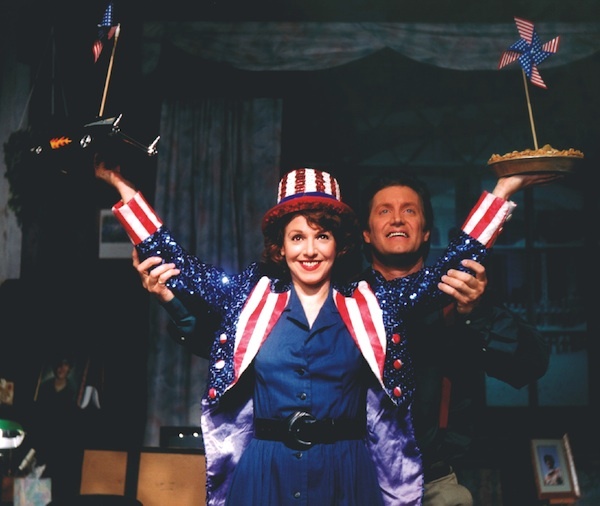 Johnny (Neal Matthews) tries to teach Katharine (Michelle Rossen) about showmanship in one of the play’s funniest scenes. 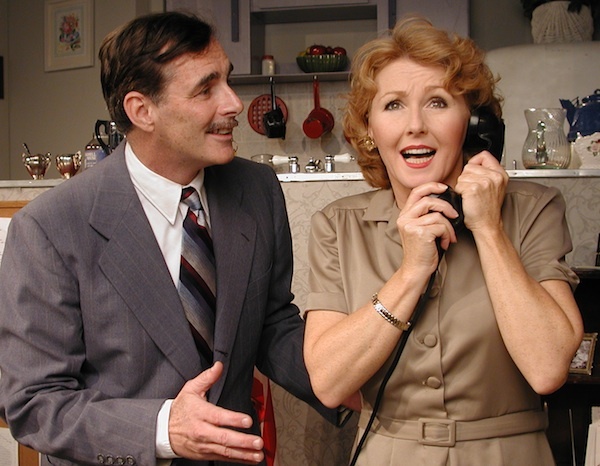 Katharine (Della Cole), joined by Johnny (Bob Curren), gets the call she’s been waiting for. Letters From the Front is a poignant, funny, moving, and very memorable theatrical experience. 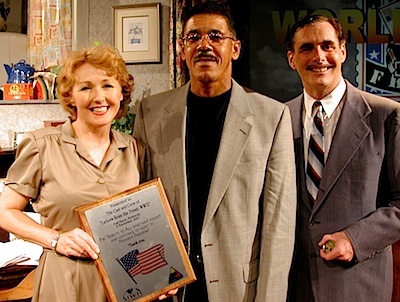 Ever since LETTERS FROM THE FRONT opened in 1991 it has only been available as an 8-1/2″ x 11″ 3-hole punched script and then only to the people who worked on the show. Now it is available for the first time to the general reading public both on Kindle and in print. The production script used by cast & crew. I have been approached by audience members many times after a performance (that’s what happens when your picture is in the playbill) asking if the play was available for purchase. Unfortunately it wasn’t a practical option until the book world tilted on its axis a few years ago and eBooks and print-on-demand changed publishing forever. This is the unabridged, word-for-word script that was used by the actors and technicians in the production of the play. Being a play, it is a very fast read. Click on the image below for order info. Click here to read the 5-star reviews by noted authors S. R. Mallery, Claude Nougat, and Christoph Fischer. The complete unabridged script is now available. Click on image for link. What is Letters From The Front about? It’s been called an emotional roller coaster. I’ve watched audiences ride that roller coaster enough times to know that there’s evidently some truth to the statement. 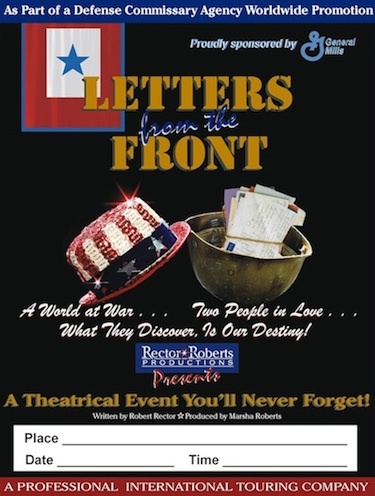 CBS Evening News called Letters From The Front “A patriotic tribute to the men and women who so bravely serve.” NBC’s Today called it: “A wonderful show.” The Shreveport Times said it was “A tear-jerking, hand-clapping, mind-blowing stroll through history.” I guess it’s all those things. This play weaves actual letters to and from soldiers and their loved ones going as far back as Valley Forge, into a story set during the waning days of WWII. The personal themes in the letters are honestly reflected, as is the commitment of everyday Americans to preserve freedom. Popular essayist Katharine Hartgrove, whose son is fighting in Northern Italy, has been commissioned to write a play based on these letters. She enlists boyfriend, Johnny Chastain, America’s favorite radio wise guy, to assist her. 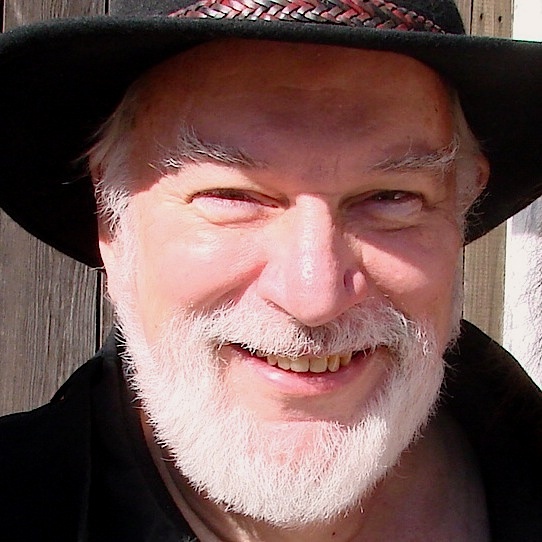 He provides an unseen twist to the story, along with plenty of comic relief. When the laughter and tears subside, Johnny is the most unlikely of heroes and Katharine is healed from emotional scars that have haunted her for 20 years. Letters From The Front is a heartfelt and surprisingly humorous story of heroism, hope, and redemption. Couldn’t have said it better myself. It’s about people, what’s in their hearts, who they love, how they deal with life’s adversities. At the core is a conflict of massive proportions – World War II. Millions are thrown into the conflagration. But Letters From the Front focuses on just two people as they struggle to understand, adjust, put events into some sort of meaningful perspective, and discover the depth of their love for each other. Inside the playbill handed out as people enter the theater there is a comment card. Over the years we’ve collected tens of thousands of them. 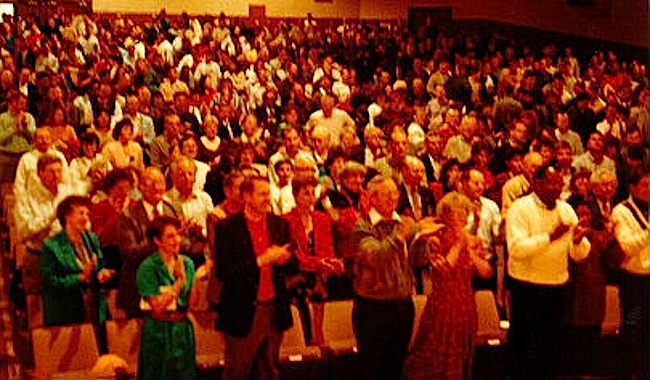 Here are examples of comments from people who have seen the show. For me, Letters From The Front has been an incredible ride. For audiences around the world to respond so warmly and enthusiastically to my play has been both rewarding and gratifying beyond words. Clearly it has touched many, many hearts. But I know the truth. A Greater Hand than mine was at work at the keyboard, and I never forget that.